First of all, I must apologize for my deafening silence. It has been a full 2 weeks since I wrote on the blog. I would like to promise that it will not happen again, but like the saying goes..... Man Proposes, God Disposes! What have I been up to? A lot actually. Aside resuming work and all the drama that comes with it, I am also preparing for a church choir concert on the 23rd August, a couples retreat workshop organized by the church on the 24th of August. And I am part of the planning committee of both programs. Work is as always work, with the fire fighting, strategic session, creative collaboration and passionate politics. It does feel that with the Ebola Virus Disease, everyone is acutely aware of his or her own mortality, and with that comes some measure of calmness and tolerance. It feels wrong somehow to argue over the accuracy of a financial budget or who should be rewarded for a great business result when doctors and nurses are risking their lives to protect the country. We owe them a tremendous amount of respect and gratitude, for those who have lost their lives and for those who fight on. For the couples retreat, which is a first of its kind in our collation of churches, I am really looking forward to hearing from seasoned experts on how to chart the roadmap to marital bliss. After all, I am but a jambite in the University of Marriage. When you talk to people that have been married for 15, 20+ years, you wonder - How on earth did you survive that long and not like explode? So, I am hoping that the one day retreat will provide the much needed answers, among other things like parenting and alternative sources of income. On the choir concert, indeed, I do sing. Actually, I like to think we are a singing family. For the music inclined folks, I sing Soprano, and the hubby sings Tenor. We are still figuring out the lil one, but it looks like he will sing Alto. Anytime I strike a tune, he ends it with an alto-like melody. All we need now is a family member who sings Bass, and we will model ourselves like the famed VonTrapp family (Sound of Music) and be called the ENEK family singers.... I can imagine us singing in some grand concert with our arms folded tightly across our bosoms ' With ABC....., with jam.... tea with jam, and bread, with jam, with jam, with jam, and breadddddddd! Jokes aside, I do take singing seriously. I think it comes from the guidance my dad gave us kids a long time ago - Work as if you work unto God; and from my mother, who always used to say 'Anything worth doing is worth doing well'. I read a story of a lady who based on her experiences modified the statement to read - Anything worth doing is worth doing. Period. She said something along the lines of there is really no need to add 'well', because if you set a high standard for yourself, it means what ever you do will always be done well. It becomes as natural as breathing. That truly got me thinking. About the standard of excellence. I would like to think it means the bar you set for yourself in life, in every task, in every endeavor, both at work or at play. That invisible yet visible bar that is sometimes stretch but definitely attainable. And as all good standards go, it must be clearly defined and measurable. Ponder on this: What is your standard of excellence? Can people say about you - anything he/she does will be done well? In our complicated world, it is easy to fall into the comfort of mediocrity/it doesn't matter/after all there are so many people any way/what difference does it make. It is easy to convince ourselves that anything that is worth doing is worth doing.....poorly. Like a well known phrase: half bread is better than chin-chin, provision store is better than kiosk! So ponder again: What is your standard of excellence? You will notice that in this discourse, there is no mention of the word 'perfect' or 'perfection', (well, except the picture, but that doesn't count) because, as fallible humans, we are not wired to attain perfection. There will always be something more that can be done, and there will always be a smart alec who will jump and point out the tiniest gap in your plan. But it is OK. What we need to do it to make it good enough. I use the choir analogy. Sometimes, when we learn a new song, it may not sound as perfect as the original version. But it is OK. As long as the melody and harmony is there, we are good to go. Sometimes to make life simpler, we give the lead to the soloist while the choir echos the chorus. It may sound radically different from the original, but its OK. And then, when we agree on our re-mix (a friend jokingly calls it Me-rix), we rehearse and rehearse until it is as pitch perfect as it can get. So, what is your standard of excellence? In the professional world, we can thank or blame Pareto for giving us the 80/20 rule which everyone explains in their own way. There are those who spend the time defining the outcome they want with the highest standard of excellence, and those who whip up the 80% quote as an excuse for mediocrity (after all, 80% is good enough so you can forget the 20%.). Poor Pareto must be turning in his grave. 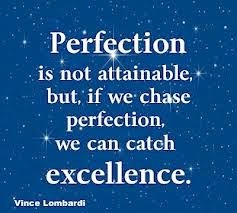 To avoid any confusion, I prefer the quote from Vince Lombardi (if he really was the one who said it) which sums it up perfectly - Perfection is not attainable, but if you chase perfection, you will for sure catch excellence. And that is what we hope for. After all, anything worth doing... is worth doing. Period. What kind of a comment is "Lovely"? If you want to comment, comment. Period. Gogo, you crack me up! Hahaha. Hope to meet you some day.